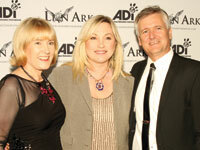 Animal Defenders International : Publications : Lion Ark Takes Off! In October, we unveiled Lion Ark – the feature-length documentary which tells the story of how the ban on animal circuses in Bolivia was secured and the animals saved. Legendary actor Brian Blessed (pictured, right) introduced the world premiere at London’s Raindance Film Festival and, days later, the US premiere took place at the California Film Institute’s Mill Valley Film Festival. Actress Jorja Fox (pictured, below) introduced the movie with, “Ladies and gentlemen, we give you the antidote to the cruelest show on earth: Lion Ark”. And we were off, with sell-out screenings, rave reviews, standing ovations and winning awards. Lion Ark is flying and, most importantly, winning hearts and minds. Lion Ark is about a serious animal welfare issue, the use of animals in circuses, but it is an uplifting, exciting, even funny, story. The lions are the stars and this time, the animals win! Please donate now and help us rescue more animals from abuse and suffering. Visit lionarkthemovie.com to read more about the movie and screenings. We wanted this film to get the audience up close with the animals, to understand their emotions and behaviour, to see past language and species. The story starts with the undercover investigations, which are covered briefly, then the lobbying and the law being secured in Bolivia. A year later, time is up for the animal circuses and the Bolivian Government asks ADI to work with them on the enforcement operation – Operation Lion Ark is underway. We had agreed with the government that domestic animals would be rehomed locally; native wildlife would be returned to the wild or protected areas; exotic wild animals would be removed from Bolivia and found homes elsewhere. The film shows how eight circuses that defy the law are tracked down, the animals saved, and a joyous finale sees 25 lions airlifted to freedom in Colorado on the Lion Ark flight. What is engaging audiences in a new way is that Lion Ark is more action adventure style than traditional documentary. This is up close and personal, right in the thick of the action; as close as you can get to these animals, understanding them and the effects of circus life. Without hiding the suffering, the progression for the animals is towards freedom – viewers get to see the animals live as they were meant to live. As the film explains, these animals cannot go back to the wild, or to Africa; we must give them the best that we can. Our aim is to get Lion Ark seen by as many people as possible, all over the world. The film reaches out to those who would not normally pay to see a documentary such as this. Audiences can enjoy the movie, and leave the cinema understanding the message! 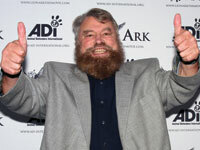 The world premiere of Lion Ark at the Raindance Film Festival in London was introduced by actor Brian Blessed, who told the audience to “Buckle up for a nail-biting adventure.... Lion Ark will leave you roaring for joy!” We were joined by songwriter Lynsey de Paul, TV host Wendy Turner Webster (pictured, right, with Jan Creamer and Tim Phillips) and presenter Gillian McKeith. After the screening the film’s producers, ADI Chief Executive Jan Creamer and Campaigns Director Tim Phillips, held a question and answer session with the audience. Afterwards, our team was surrounded by crowds wanting to know more and find out how they could help. A long day for our London Lion Ark premiere team, but a great start to the film festival season! 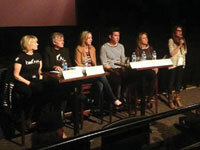 The next day, we headed on to the US premiere at the Mill Valley Film Festival in California. Over 300 people attended the sell-out show. Over the following weeks Lion Ark took the festival circuit by storm across the US, securing critical recognition. Twenty-four hours after the first Mill Valley screening, we hopped over to screen at the San Diego Film Festival – where we won our first award, Audience Choice Best Documentary. Then it was time to race back to Mill Valley for the second screening. Next up was the Hawaii International Film Festival where extra screenings were added, followed by the Fort Lauderdale International Film Festival in Florida, where a reviewer recommended Lion Ark for Oscar® consideration. From Florida, it was off to the Virginia Film Festival at Charlottesville and a glowing introduction by award-winning and Emmy-nominated documentary maker Joe Fab. Starz Denver Film Festival in Colorado was next – home to our Lion Ark prides – where four back-to-back sell-out screenings and two special fundraising receptions were held; and we got to visit the lions too! The Sun & Sand Music & Film Festival in Mississippi saw Lion Ark win Best Documentary Jury Award and we were thrilled that Dr Mel Richardson could be there with us – tragically it was the last time we saw Mel. Read our tribute to “Dr Mel” here. Two week-long runs with daily screenings were held in New York and Los Angeles, beginning with a special VIP fundraising screening in Beverly Hills with guest of honour Bob Barker (pictured, right). The Hollywood Reporter followed a glowing review by listing Lion Ark as one of 25 Best Documentary Oscar® contenders. In less than two months, Lion Ark had certainly roared to public attention! Lion Ark wrapped up the 2013 tour at the Anchorage International Film Festival, Alaska, winning another Audience Choice Award for Best Documentary. This amazing start to the life of this important film could not have been achieved without our amazing volunteer teams – a huge, huge thank you to everyone who helped to promote Lion Ark and helped on our information tables, giving out leaflets, taking donations and selling the important Lion Ark t-shirts! During 2014, our aim will be for Lion Ark to continue to alert audiences about animal circuses – as well as gather support for our next rescue – getting the circus animals out of Peru! In addition to the film festivals (watch the websites for news on these), we plan a tour of special screenings in key cities – and we are looking for local volunteers to help us to organise the events. Lion Ark has been nominated for Outstanding International Motion Picture in the prestigious 45th Image Awards presented by America’s oldest and largest civil rights organisation, the National Association for the Advancement of Coloured People (NAACP). At the Nominees Luncheon in Hollywood a group picture is taken of each year’s nominees – this year including ADI’s Jan Creamer and Tim Phillips – and the picture is placed in the US Library of Congress. Pictured above: Jorja Fox, Associate Producer of Lion Ark, on the red carpet in Hollywood at the Nominees’ Luncheon of the NAACP Image Awards in February. Visit lionarkthemovie.com to watch the Lion Ark trailer and reactions to the film.